Andrew Wrenn's training session was designed to model the approach to planning an historical enquiry set out by Michael Riley. It took teachers through a range of activities already successfully trialed with Year 7 classes at Ailwyn Community School in Ramsay, Cambridgeshire. The main feature of planning were steps towards a final significant outcome but this model elaborated on the Riley one by introducing sub-questions for each step. The final enquiry question: ‘Joan of Arc - Saint, Witch or Warrior?' veered away from a pure focus on interpretations of history since it was asking pupils for their own view of Joan rather than looking at how differing views of Joan emerged subsequent to her lifetime. Nevertheless, the sub-questions of the enquiry introduced pupils to activities that dealt fully changing interpretations of Joan over time, and these informed pupil perspectives in the final extended writing. Step 1 - Who was Joan of Arc? Pupils were shown a video clip from the CBS television film Joan of Arc (1999) of the burning of Joan of Arc at the stake. The sub-question, "Who was Joan of Arc?" was deliberately withheld so as not to give away the gender of the actress in the film. A still image from the film was placed inside a layers of inference diagram under the title "What does this source tell me?". Pupils annotated around the picture. The pairs subsequently moved outwards from the centre in their notemaking, going from concrete details to more abstract questions: "What can I guess, or infer from this source? What questions must I ask because this source does not tell me?" After this activity, pupils went on to compare two further images, a contemporary cartoon-like picture of Joan from 1429 and a highly romanticised nineteenth century portrait. At the end of the lesson, pupils had to consider why some of them had assumed that the actress in the film was a man. Step 2 - What do we know about Joan of Arc? Still knowing only a little about Joan, pupils were shown a quotation from a 1970s Ladybird book explaining different views about her which concluded: "Who shall say which was right; all we know is that she saved France." In groups, pupils were given an array of images of Joan depicting her through time from 1429 to the present. Through class discussion, teachers helped to define the terms patriot, saint, warrior, witch and ordinary person. The group then arranged the images on a sorting frame of linked circles, allowing pupils to place an image across more than one category. 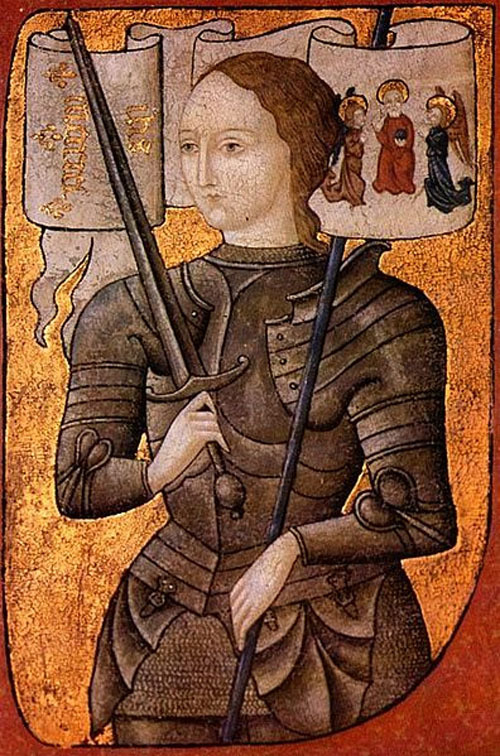 Step 3 - How important was Joan of Arc in her lifetime? Teachers used a double page spread from History Scene 2 depicting the causes and consequences of the Hundred Years War between France and England in cartoon form with a series of maps. This supported teacher explanation of the chronological overview of the conflict. Individual pupils used the cartoons and maps to plot the relative fortunes of France between 1328 and 1453 in different colours on a living graph. The horizontal axis is marking the timeline, with the vertical axis asking for qualitative judgement between ‘strong' and ‘weak'. Pupils next contrasted video clips depicting the Siege of Orleans in 1429 with contemporary chronicle accounts of the same events. Pupils then debated the importance of Joan's intervention at Orleans and in later battles. How important was she in turning the war in favour of the French? As a concluding episode, pupils were asked to choose a number between 1 and 10 considering how important they thought Joan was in her own lifetime. The numbers were displayed in a line. Pupils moved to stand by the number of their choice. This process is called a human continuum. Step 4 - Why do some people think Joan did not receive a fair trial? Classes participated in a roleplay of Joan's trial using a transcript of the actual events of February 1431. They assumed the roles of clerical assessors from the jury and considered her guilt or innocence against the charges. Step 5 - When did France need Joan most? 1520 - Francis I made France the most powerful kingdom in Europe. 1870-1 - Prussia defeated France and took some French land. Groups used the cards to plot the highs and lows of French history onto the graph. They were then given the same set of images used in Step 2. They placed these along the horizontal axis of the graph in line with the period in which they were produced. Pupils soon noticed how many images of Joan were produced at times of crisis or low ebb in French history. Step 6 - Joan of Arc, Saint, Witch or Warrior? This made pupils record how and why their ideas about Joan had changed or stayed the same. This text is drawn from an article of the same title in Issue 115 of Teaching History.